There are exactly two and only two things I look forward to on Thanksgiving Day. The first is a big slice of sweet pumpkin pie with whipped cream and the second is my celery root and sausage stuffing. Stuffing is a treat. I love everything about it, the bread and the herbs and spices. I don’t really make it any other time of year so it’s 12 months worth of anticipation. My favorite stuffing recipe is adapted from a Martha Stewart recipe with leeks and celery root but I added sausage and cut out the nuts. When I’m in the mood to use the leeks, I leave them in but I prefer onion so I usually swap them out. I know you are thinking what the heck is celery root? 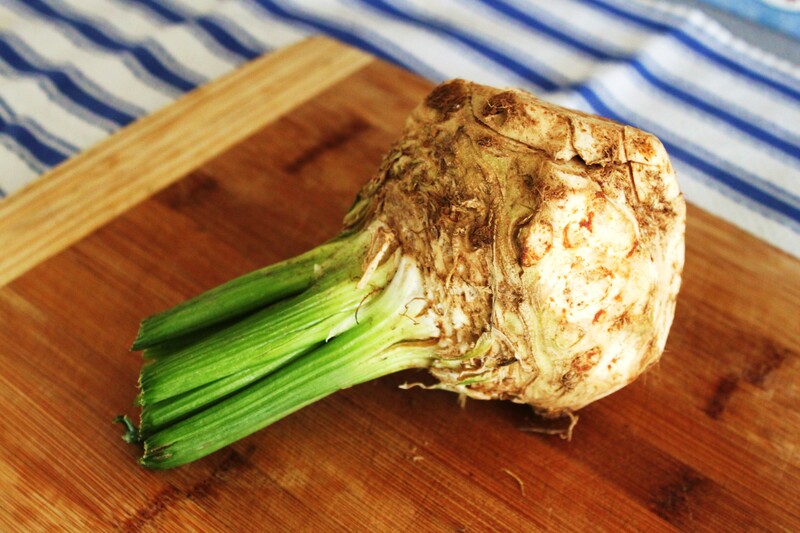 Celery root is also known as celeriac; it’s the root of a certain kind of celery used in soups, stews and roasted in the oven. In my opinion it has to be the most under-appreciated veggie out there. I know it looks gnarly from the outside but once you cut off the skin the inside is so delicious. Its earthy, savory and meaty. 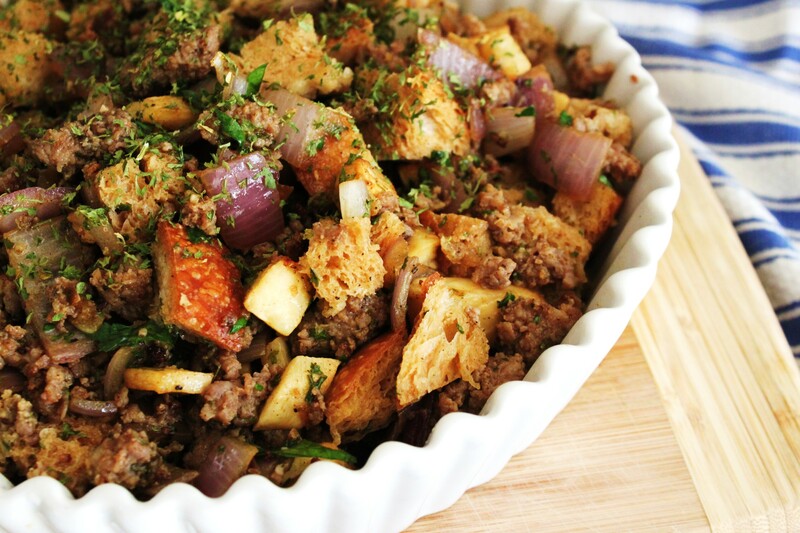 I’ve been making this stuffing now for 4 years running and I love it. I’ve heard no complaints from my guests either. It’s perfect. It’s delicious. You have to try it. I’m serious. The humble celery root. Looks like it can’t possibly be yummy – but it is. The cast. In the bowl ready for mixing is the roasted celery root, cooked sausage, sauteed onion, minced garlic and chopped parsley. The bread is down on the bottom too. Next up I added the stock and stirred. Add mixture into a buttered dish ready for baking. I put little slices of salted butter on the top and cover it. After a little while in the oven, you come out with this savory, buttery, herb infused masterpiece. A perfect addition to any holiday table. Enjoy! Preheat oven to 425 degrees. Toss celery root and oil in a medium bowl. Season with salt and pepper. Arrange in a single layer on a rimmed baking sheet, and roast, stirring once, until celery root is tender and edges are golden brown, about 40 minutes. You can also, cook the celery root in a skillet on the stove top with a little bit of olive oil. Melt 1 stick butter in a medium saucepan over medium heat. Add garlic and onions, and cook, stirring often, until soft, about 10 minutes. Add the celery root, sage, parsley, and 4 cups stock, stirring to combine. Season with salt and pepper. Remove from heat. 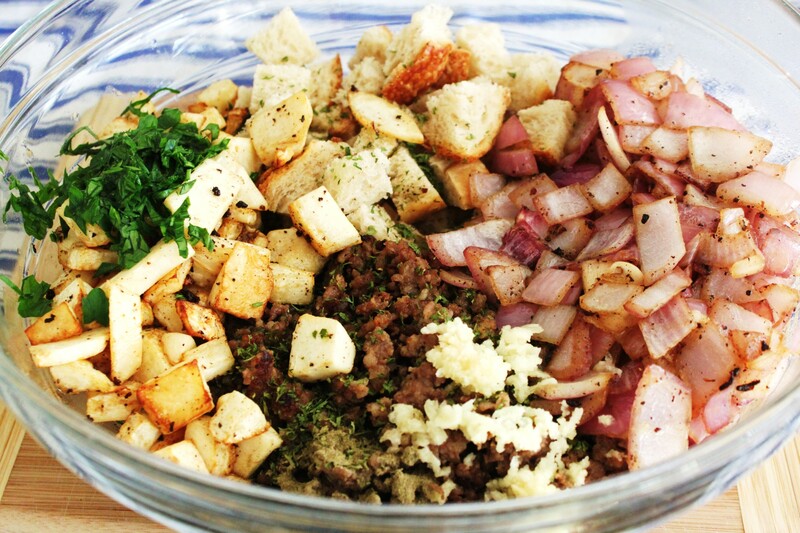 Toss bread with vegetable mixture in a large bowl. Season with salt and pepper. Stir in remaining 1 cup stock, spoon into a buttered 9-by-13-inch baking dish, and dot with remaining 1/2 stick butter. Cover with parchment, then foil, and bake in a 375-degree oven for 25 minutes. Uncover, and continue to bake until golden brown, 15 to 20 minutes. Wow, this looks delicious. 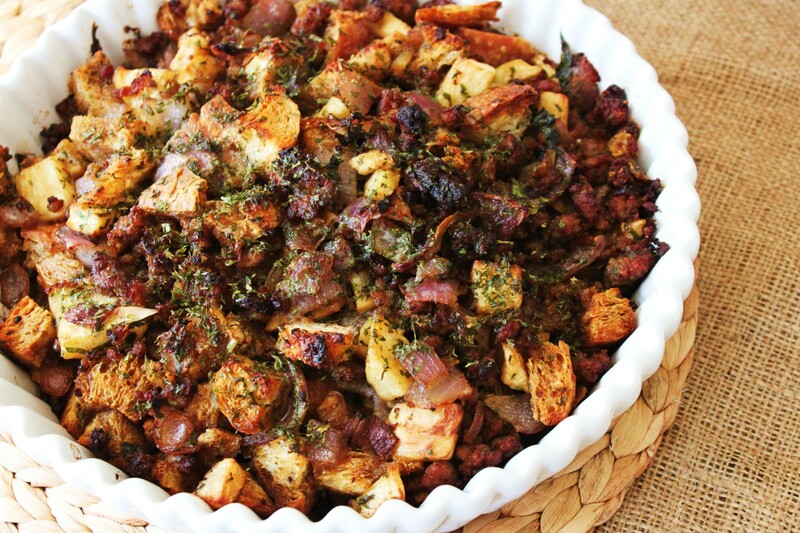 I need to have another Thanksgiving dinner asap so I can make this. And I totally agree, celery root is sooooo under appreciated!